The Orator's Briefcase PA System Seems Perfect For Manic Street Preachers | OhGizmo! By Andrew Liszewski on 08/30/08 • Leave a comment! If you spend your days on a busy street corner preaching to the masses at the top of your lungs, you’ve probably noticed that people tend to ignore you more often than not. But don’t worry, I’m sure they care what you have to say, it’s probably just that they can’t hear you over all the hustle, bustle and traffic. 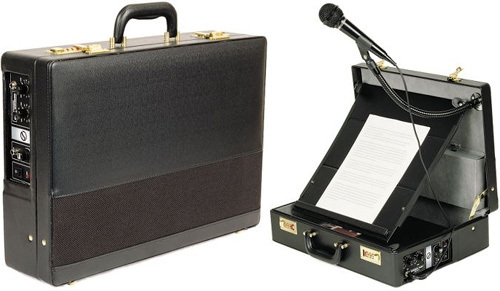 So might I suggest this Orator’s Briefcase that will not only bring an added level of professionalism to your rants, but will also ensure that everyone in a block’s radius will hear your message thanks to a 20-watt amplifier and dual 4-inch speakers. With the briefcase open you also have a pop-up lectern on which to organize your notes, and it comes with both a handheld condenser mic that can be attached to a gooseneck arm, as well as a 3/4-inch lavalier mic that clips to your tie, lapel or collar of your t-shirt. A control panel on the side of the briefcase allows you to make adjustments to the volume and tone, while line-out ports make it easy to hook up to external speakers or provide a feed to a recording device. You can get one from Hammacher Schlemmer for $349.95.